It’s no secret that I come from a small town in Northeast Oregon, Elgin, Oregon to be exact. Elgin is like many of the small towns in America, more often than not it is peaceful, safe and friendly, so when this small town lady decided to spend a night on the town in the big city of Portland, it was, to be honest, pretty exciting and at the end of the night I realized that Portland, believe it or not, is a lot like Elgin. My adventure started when I climbed onto the Max in Beaverton. Now to people who ride the Max every single day, I am sure this sounds like no big deal, but to me….this was a big deal. I’ve been on cattle drives and gone to more rodeos than I can count. I’ve seen four cougars, three bears and one wolf, but I’d never ridden the Max by myself, especially knowing I would be going back…at night (insert dun dun dunnn music here). I kept track of the stops on my phone and loaned a pen to a young man who had misplaced his. All in all the people seemed….like people. Stop after stop, and a daring race through a tunnel 260 feet below the surface, I finally arrived at my destination. As luck would have it the Max stopped within 50 or 60 yards of the front door to the Oregon Convention Center, where the Oregon Entrepreneurs Network Tom Holce Entrepreneurship Awards were taking place. Shaking off the raindrops that had gathered on my jacket, I stepped inside and it was as if they knew I was coming. “What is your name,” the young lady asked me. “Kimbel,” I said. “Lori Kimbel.” As it so happened a gentleman, also with the name Kimball was right in front of my, so he and the young lady had already been discussing me, it made me feel like I was back in my hometown walking into a conversation at the local post office lobby. The main event would not start for another hour, which left me time to visit with newfound friends and learn about some of the entrepreneurs that were showcasing their business and/or product. Bull Run Whiskey was my first stop. I always enjoy hearing about the process taken to create a product and the gentleman behind the counter was more than happy to explain the subtle difference between the different bottles of whiskey, one of my favorite spirits. I decided on a sip of the Oregon Single Malt Whiskey; it was smooth and left me wanting more, but I wandered away after thanking him, making my way to the complimentary drink station next to the whiskey station. After ordering a sangria, the unmistakable smell of fire roasted s’mores filled my senses. James, from Nineteen 27 S’mores, gave me a quick rundown of the business that he and his wife, Kelly, started late in the summer of 2015. The unmistakable fire that burns within the heart of every entrepreneur was evident in James. The S’mores experience reminded me of sitting around the fire at my brother’s ‘white tail camp’…..well, maybe that was the whiskey I’d just shot, either way, once again, I was reminded of home. I made my way through the crowd, stopping in at each table to learn a little bit about each business owner and why they had decided to become entrepreneurs. I sampled delicious bar-b-que sauces of Felton and Mary’s Artisan Foods, tasted some wonderful peanut butter at Eliot’s Adult Nut Butters, had a bite of some spicy beef from Don Felipe Products and drank some of the best hot cocoa I’ve ever had from Treehouse Chocolate. I knew I had to save room for dinner, so networking was next on my agenda. I met some great people throughout the evening and thoroughly enjoyed learning about what their passions were and what made them want to be a part of the evening dedicated to Oregon entrepreneurs. Throughout my career and the many networking events I have attended, I find that just being from Oregon and having that commonality is enough of a connection to start lasting friendships. Oregonians are proud of their state. Who wouldn’t be? We have Mt. Hood, Wallowa Lake, Multnomah Falls, the Columbia River Gorge, the Oregon Coast, Portland…..and Elgin. We are also proud of the people who call Oregon home and who have dedicated their lives to making the world a better place. Once the ceremony started I was swept up into the emotions of the evening. I have never met Linda Weston, the outgoing president and executive director of OEN, but was sure that when we do meet, we are going to have a great visit. The annual awards ceremony honors the skill and the courage that it takes for entrepreneurs to create a business out of an idea. The event is intended to not only celebrate entrepreneurs, but to highlight their importance to the region’s economy. This year’s Awards Ceremony, “Create Your Legacy,” also celebrated OEN’s 25th year and paid tribute to Weston, who will be retiring at the end of 2016 after 17 years. It was a night of inspiration and entrepreneurial spirit from start to finish. Weston set the tone as she highlighted what her journey has been like over the past 17 years at the helm of Oregon’s Entrepreneur Network. Her passion for business and the people who create them was evident and it was obvious her presence at OEN will truly be missed by those who know and love her. 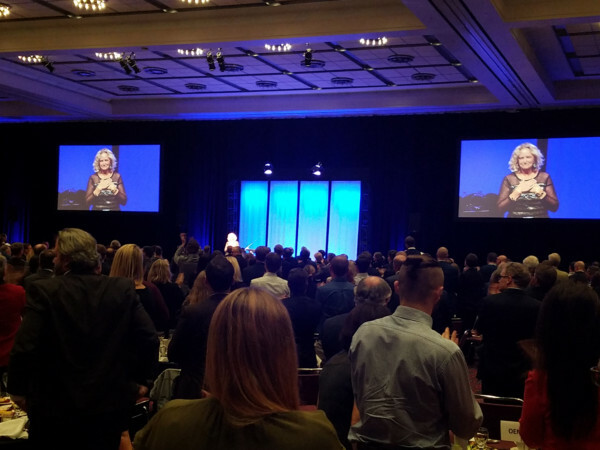 This year’s Awards Ceremony marks the final year of Linda’s remarkable 17-year tenure as President and Executive Director of OEN. She will be retiring and launching a consulting company at the end of 2016. Under Linda’s leadership, OEN has experienced significant growth and expanded its impact across the state, serving more than 52,000 participants since 1999, generating $10,792,545 in donations and sponsorship revenue, and securing more than $1.1 million in grant funding to expand access to OEN services in underserved areas. In 2002 and 2005, Linda was selected by Portland Business Journal as one of 25 outstanding Women in Business. In 2005, she was one of three national finalists for the “Supporter of Entrepreneurship” award in conjunction with Ernst & Young’s Entrepreneur of the Year Awards. In 2007, she was recognized by Northwest Women’s Journal as one of “100 Most Powerful Women” in the Northwest. The OEN Board ‘passed the hat around’ so to speak, and raised $16,000 for a ‘trip of a lifetime’ for Weston, who is an avid traveler. Weston however was not the only one to receive a gift during the award ceremony. Sam Blackman and Jesse Rosenzweig, co-founders of Elemental Technologies, presented a $150,000 check to OEN to support its services. From 141 nominees for the 2016 OEN Tom Holce Entrepreneurship Awards, the finalists were narrowed down to 20 after a series of interviews and reviews by OEN’s expert judging panels. The categories included Volunteers of the Year, Startup Stage, Development Stage, Growth Stage, Wyatt Starnes, and Entrepreneurial Achievement. The Game Changer Award was decided by the audience during the award ceremony and went to Nadya Okamoto of Camions of Care. Camions of Care is a youth-run global nonprofit that strives to manage and celebrate menstrual hygiene—through the global distribution of feminine hygiene products, and the engagement of youth leadership through a nationwide network of campus chapters. In the last two years, its network of over 2,200 volunteers has addressed over 24,000 periods through over 40 nonprofit partners. Bright.MD and Radar were the other two finalists in this category. Volunteers of the Year where Terry St. Marie, Co-Founder of Built Oregon, Ernie Bootsma, Parter at Ater Wynne, and Ann McQuesten, Corporate Associate at White Summers Caffee & James LLP. The Startup Stage Award, which honors a company with projected revenue for the current year of less than $0.5 million, went to Hubb, which automates the complex workflows and tasks required to collect, manage and market content for your next conference or meeting. Runners up were Crystal Clear Technologies and NemaMetrix. The Development Stage Company Award honors a company with past-year revenue of at least $0.5 million and projected revenue for the current year of $0.5 – $8 million. Customer.io, which is a platform that uses application data and rules to message users, was the winner of this award. Senaptec and Wildfang were runners up. The Growth Stage Company Award honors a company with past-year revenue of at least $8 million and projected revenue for the current year of over $8 million. Ruby Receptionists, which is the only virtual receptionist service dedicated to making personal connections with your callers, was the recipient for 2016. FCR, iovation and Puppet were runners up in this category. The Wyatt Starnes Memorial Award honors the region’s most promising early stage tech entrepreneur. Runners up included Brian Martin of Recentia Health Corp, David Schaefer of eWind Solutions, and Dylan Vance of Jupiter Devices. The Wyatt Starnes Memorial Award winner was Tyrone Poole of NoAppFee.com. In 2005, Tyrone was training to become a firefighter at Portland Community College. He suffered an injury that badly damaged his left leg, leaving him unemployed, unable to pay his debt, and evicted from his apartment. He eventually ended up in a homeless shelter. Tyrone founded NoAppFee.com to help combat unnecessary homelessness. NoAppFee.com revolutionizes the way renters find homes by screening potential renters against every vacancy in a market, eliminating the need for multiple, costly applications. The Entrepreneurial Achievement Award honors an entrepreneur or founding team with a strong record of success over the past 18 months. Monica Enand, Ceo and Founder of Zapproved was the recipient of this award. Runners up were Oliver Alexander and Orion Falvey co-founders of Orchid Health, as well as Trevor Mauch, founder of Carrot. Then, just like that the, evening was over. I said goodbye to the people I’d bonded with over a chicken and mashed potato dinner and a bottle or two of wine, knowing we would be connected forever if only on LinkedIn. I slipped on my coat and walked out into the night air. I was downtown Portland and I felt safe after spending an evening with 500 of my newest friends. A few walked my direction toward the Max. I marveled at the glass towers of the Convention Center as I waited for the ‘Blue Line’ to arrive. Once on board I texted a friend explaining how I was on the Max leaving downtown Portland, but there was no need for her to worry about me, because Superman himself was seated within ten feet of me. Grant it he was about 20 years younger than most Supermen, and not quite as buff, but Superman just the same. Then Trudy arrived, she asked to sit beside me and told me about her evening experience at the Tony Bennett concert. “He is 90 years old and his voice is just as strong as ever,” she exclaimed. Yes, tonight, my wonderful night out on the town in Portland felt like home, Portland felt like Elgin…peaceful, safe and friendly.